Brocach. Photo by Michael Horne. 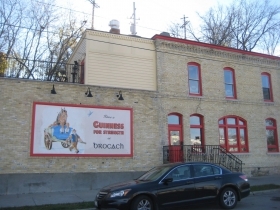 A fake Irish bar will become a real British pub if the Milwaukee Common Council grants a license on November 25th for Red Lion Pub on Tannery Row, 1850 N. Water St.
Partners David Price and Chris Tinker (Three Lions Pub) along with Drew Deuster and J.J. Kovacovich (Red Rock Saloon, McGillycuddy’s Bar and Grill), hope to have the tavern and restaurant open by December 1st. 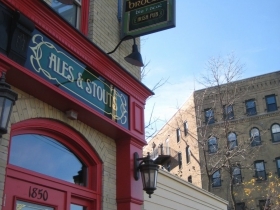 It would replace the Irish-themed Brocach, which opened in 2007 after great improvements were made to the old Five and Ten bar, which closed in 2001. The potential operators spoke to about 20 neighboring residents at the closed tavern Wednesday, November 6th, with Price as the principal spokesperson for the group. The meeting was called by Ald. Nik Kovac, who sent letters to neighbors to get their input prior to the License Committee hearing scheduled for 9 a.m. Monday, November 10th. “On Brady Street and [further south on ] Water Street, traffic is a given. Here, you need a reason to draw people in,” he said, speaking of the tavern’s relatively solitary location, snuggled as it is into a hillside across from the vast former Gallun Tannery site, which awaits redevelopment. He hesitates using the “gastropub” term for the place, saying it would be a lot cheaper than the current model, such as The Rumpus Room. In fact, the tavern application asks for the potential age of customers, and the applicants filled it out with “1-99.” Yes, they are optimistic. The music will be British as well, ranging from the Beatles and the Rolling Stones to more recent groups like Oasis and the Arctic Monkeys. Deuster and Kovacovich, the American-born partners, did some brainstorming on the name of the tavern and come up with what they thought was the original and clever “Red Lion” by merging the names of Three Lions with Red Rock. “It was either that or Three Rocks,” Kovacovich joked. Community meeting at Brocach. Photo by Michael Horne. Price got the biggest laugh out of that, since “Red Lion,” he said, was the most common pub name in England, and anything but original. One neighbor objected to the tavern’s request for 16 Monday movie nights on the patio, saying the noise from the R-Rated productions easily penetrated the walls of his house. 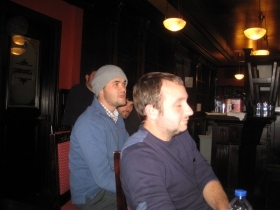 However, when polled by the alderman, none in attendance objected to the granting of the license for the new bar. 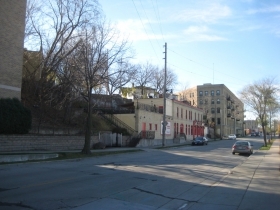 Price said he likes the “hip aspect of [nearby] Brady Street,” and said one of his favorite things about Milwaukee versus other American cities is that “every area has its own districts,” with their individual characteristics, such as Brady Street, Riverwest, Bay View and the nascent Walker’s Point neighborhood. This area is prime for the young professional crowd, the partners agreed, adding they do not plan to do “$1 Jagerbomb” specials or $10 all-you-can-drink nights. They plan to offer “good beer” in the “$5-$6 range.” The application also anticipates 40 per cent of the sales will be food. One neighbor, however, noted that many bars in the area inflate their food percentage to get a license, then abandon the cuisine in favor of the higher profit alcohol sales. This will not be the case here, the partners said, adding that besides serving pub-style food, Red Lion will offer catering for parties, events and other activities. The partners will spend about $25,000 on renovations to the bar and deep-cleaning, which is underway. 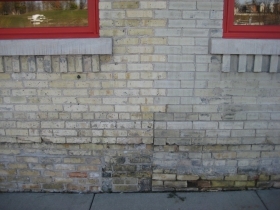 The trim on the 1880’s Cream City brick building has a new coat of red paint; the Guinness sign on the exterior wall will be painted over along the lines of something a little more Union-Jacky. The tavern is expected to be open seven days a week. It will open at 10 a.m. during weekdays, and at 6 a.m. on Saturday and Sunday, which is prime time for watching European Soccer matches. The partners paid $20,000 for the business and fixtures, which can be applied toward the purchase of the real estate at the end of the lease, which runs until 2019. Rent is $10,000 a month; the building is owned by Brocach’s Clifford McDonald, who paid some $550,000 for it in 2007. The partners estimate gross food revenue of $700,000 per year from the operation, and have hired a chef formerly with the Capital Grille, as well as importing a manager from England. Has Brocach already closed or ?? 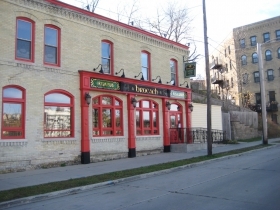 I’m so disappointed that Brocach will close! We loved the menu. This is just the start of fabulous things happening on North Water Street. Been to Red Lion tonight and I’m telling everyone to check it out. I loved it!